If economy-wide average nominal wages fail to keep pace with the inflation rate then it means the profit share in GDP is rising. We also have to consider productivity movements. The wage bill is a flow and is the product of total employment (L) and the average nominal wage (w) prevailing at any point in time. Stocks (L) become flows if it is multiplied by a flow variable (W). So the wage bill is the total labour costs in production per period. We might consider the aggregate price level to be measured by the consumer price index (CPI) although there are huge debates about that. Now the nominal wage (W) – that is paid by employers to workers is determined in the labour market – by the contract of employment between the worker and the employer. The price level (P) is determined in the goods market – by the interaction of total supply of output and aggregate demand for that output although there are complex models of firm price setting that use cost-plus mark-up formulas with demand just determining volume sold. So the real wage (w) tells us what volume of real goods and services the nominal wage (W) will be able to command and is obviously influenced by the level of W and the price level. For a given W, the lower is P the greater the purchasing power of the nominal wage and so the higher is the real wage (w). Two other points to note. The wage share is also equivalent to the real unit labour cost (RULC) measures that Treasuries and central banks use to describe trends in costs within the economy. Please read my blog – Saturday Quiz – May 15, 2010 – answers and discussion – for more discussion on this point. However, if the real wage is falling we cannot conclude that the wage share is also falling. Given the nature of ratios, if the numerator (in this case, the real wage) is falling but not by as much as the denominator (in this case, labour productivity) then the overall ratio can actually be rising. When will the workers wake up? (a) Cannot tell because we don’t know the scale of the private domestic sector saving as a % of GDP. The answer is Option (c) – A fiscal deficit.. Assume, now that the private domestic sector (households and firms) seeks to increase its overall saving ratio (the gap between overall private domestic spending and the income it receives as a proportion of its total income) and is successful in doing so. Consistent with this aspiration, households may cut back on consumption spending and save more out of disposable income. Firms may also reduce their spending (investment). The immediate impact is that aggregate demand will fall and inventories will start to increase beyond the desired level of the firms. Firms will soon react to the increased inventory holding costs and will start to cut back production. How quickly this happens depends on a number of factors including the pace and magnitude of the initial demand contraction. But if the households persist in trying to save more and consumption continues to lag, then soon enough the economy starts to contract – output, employment and income all fall. If the private sector persists in trying to increase its overall saving ratio then the contracting income will clearly push the fiscal balance into deficit or into greater deficit (depending of the starting position). The undeniable result is that if there is an external deficit and the private domestic sector saves overall (a surplus) then there will always be a fiscal deficit. The higher the overall private saving, the larger will be the fiscal deficit. Assume that the inflation and nominal interest rates both zero and constant. Consider a country with a public debt to GDP ratio of 100 per cent, which the mainstream economists consider to be dangerously high. The mainstream prescription is to run primary fiscal surpluses to stabilise and then reduce the debt ratio. Under the circumstances given, this strategy will only work if there is positive real GDP growth. First, some background theory and conceptual development. The unnecessary practice employed by fiat currency-issuing governments of issuing public debt $-for-$ to match public net spending (deficits) ensures that the debt levels will always rise when there are fiscal deficits. However, in mainstream theory, the framework for analysing these so-called ‘financing’ choices is called the government budget constraint (GBC). which you can read in English as saying that fiscal deficit in any year (t) = Government spending (G) + Government interest payments (rBt-1) – Tax receipts (T) must equal (be “financed” by) a change in Bonds ((ΔB)) and/or a change in high powered money ((ΔH)). The triangle sign (delta) is just shorthand for the change in a variable. The subscript t means the current period and t-1 is the previous period. From an MMT perspective, this equation is just an ex post accounting identity that has to be true by definition and has no real economic importance. In a stock-flow consistent macroeconomics, this statement will always hold. That is, it has to be true if all the transactions between the government and non-government sector have been correctly added and subtracted. MMT tells us that there is no ‘funding’ constraint on government deficits. But for the mainstream economist, the equation represents an ex ante (before the fact) financial constraint that the government is bound by. The difference between these two conceptions is very significant and the second (mainstream) interpretation cannot be correct if governments issue fiat currency (unless they place voluntary constraints on themselves and act as if it is a financial constraint). Further, the mainstream theory claims that if governments increase the money growth rate (they erroneously call this “printing money”) the extra spending will cause accelerating inflation because there will be “too much money chasing too few goods”! Of-course, we know that proposition to be generally preposterous because economies that are constrained by deficient demand (defined as demand below the full employment level) respond to nominal demand increases by expanding real output rather than prices. There is an extensive literature pointing to this result. So when governments are expanding deficits to offset a collapse in private spending, there is typically plenty of spare capacity available to ensure output rather than inflation increases. Nothwithstanding the reality, the mainstream economists thus eschew ‘monetary’ funding options, and argue that as a better (but still poor) solution, governments should use debt issuance to “finance” their deficits. Thy also claim this is a poor option because in the short-term it is alleged to increase interest rates and in the longer-term is results in higher future tax rates because the debt has to be “paid back”. Neither proposition bears scrutiny – you can read these blog posts – Will we really pay higher taxes? and Will we really pay higher interest rates? – for further discussion on these points. The standard mainstream framework, which even the so-called progressives (deficit-doves) use, focuses on the ratio of debt to GDP rather than the level of debt per se. 2. The ratio of the primary deficit (G-T) to GDP. So it is clear that the public debt ratio can fall even if there is an on-going fiscal deficit if the real GDP growth rate is strong enough. This is win-win way to reduce the public debt ratio. But the question is analysing the situation where the government is desiring to run primary fiscal surpluses. Consider the following Table which captures the variations possible in the question. In Year 1, the B/Y(-1) = 1 (that is, the public debt ratio at the start of the period is 100 per cent). The (-1) just signals the value inherited in the current period. We have already assumed that the inflation rate and the nominal interest rate are constant and zero, which means that the real interest rate is also zero and constant. So the r term in the model is 0 throughout our stylised simulation. In Year 1, there is zero real GDP growth and the Primary fiscal balance is also zero. Under these circumstances, the debt ratio is stable. Now in Year 2, the fiscal austerity program begins and assume for the sake of discussion that it doesn’t dent real GDP growth. In reality, a major fiscal contraction is likely to push real GDP growth into the negative (that is, promote a recession). But for the sake of the logic we assume that nominal GDP growth is 1 per cent in Year 2, which means that real GDP growth is also 1 per cent given that all the nominal growth is real (zero inflation). We assume that the government succeeds in pushing the Primary fiscal surplus to 1 per cent of GDP. This is the mainstream nirvana – the public debt ratio falls by 2 per cent as a consequence. In Year 3, we see that the Primary fiscal surplus remains positive (0.5 per cent of GDP) but is now below the positive real GDP growth rate. In this case the public debt ratio still falls because the GDP growth rate is deflating the denominator of the public debt ratio while the numerator is falling due to the primary fiscal surplus. In Year 4, real GDP growth contracts (0.5 per cent) and the Primary fiscal surplus remains positive (1 per cent of GDP). In this case the public debt ratio still fall which makes the proposition in the question false. This result occurs because the numerator is falling faster than the falling denominator. 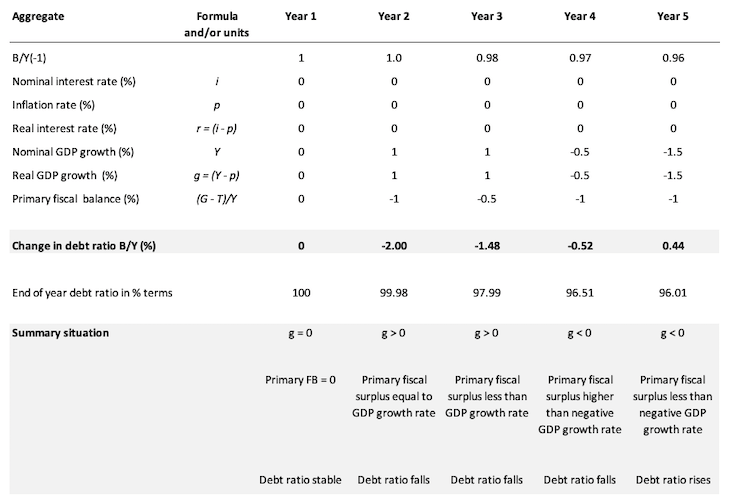 So if you have zero real interest rates, then even in a recession, the public debt ratio can still fall and the government run a fiscal surplus as long as Primary surplus is greater in absolute value to the negative real GDP growth rate. Of-course, this logic is just arithmetic based on the relationship between the flows and stocks involved. In reality, it would be hard for the government to run a primary surplus under these conditions given the automatic stabilisers would be undermining that aim. In Year 5, the real GDP growth rate is negative 1.5 per cent and the Primary fiscal surplus remains positive at 1 per cent of GDP. In this case the public debt ratio rises. This would be the typical situation. On another site I read one of the poster posted this. Could someone tell me why he is wrong where I tried to bold it. Better to ignore this type of opinion. This sort of arrogance (which is disguising ignorance) is becoming common now as more and more people are realising their ideas are looking flaky. Engaging with them gives their defunct views and arrogance ill-deserved oxygen. They will not change through discussion and soon turn to personal abuse. I cannot see the point of slugging it out on the Internet with strangers who hold views like this. It is better to let the current MMT wave flow straight past them and leave them stranded with their irrelevance. However, I agree that one has to choose the battles worth fighting wisely, if one is to win the war. Predictive capability: most MMT economists actually foresaw the GFC and the “difficulties” of the common currency in Europe and refused to believe the proclamation of tthe “Great Moderation”. Also you could point at their refusal to acknowledge the impending doom to befall Japan because of their public debt/deficit while in fact the mainstream keeps “adjusting” their predictions and rescheduling that crisis for a later time. Also, if that poster goes by predictive capability, surely he is not in favor of the neoliberal mainstream either, is he? That guy has either never heard of the current account balance (CAB), in which case his ignorance about MMT should prompt you to ignore him (or try to educate him), or he is deliberately leaving it out in order to make a point, in which case he is being intellectually dishonest. I would probably follow Bill’s advice, but if you don’t: give him hell! Hermann, I’m not going to reply to him. The ‘lower government deficits mean higher private sector deficits’ sentence seems sort of like a double negative and so is hard to understand. If i changed it to ‘lower government deficits mean lower private sector surpluses’, wouldn’t that be easier to understand? And more likely to be true in most cases? But, thanks for your reply. For the private sector to see a surplus, (S – I) > 0, the government needs to spend more than it taxes so G – T > 0 as well. Since we are discussing educating unrelenting neoliberals, I would welcome any suggestions for countering the neo-mercantilistic approach that all countries can achieve balanced budgets if they only export more and import less (nevermind there is little reason to force a balanced budget to begin with). The logical step, that not all countries can export more than they import at the same time is often countered by the moralistic view that exporting countries are thriftier and more disciplined than those “lazy southerners”. This thinly-veiled discrimination is used to justify the “Japan anomally” as well and is hard to counter, because it’s pure gut and little brain.